It’s fairly well-known that AC Milan prefer to wear their white change kit in Champions League finals. In both the 2005 and 2007 finals against Liverpool, the Italian club actually won the coin-toss for colours but on each occasion opted to switch, which would make one wonder why there was a need for a toss at all. Milan have played in eight European Cup or Champions League finals – 1963, 1989, 1990, 1994, 1995, 2003, 2005 and 2007 – wearing all-white, winning six and losing two. In their usual rossoneri, the club have played in three finals (1958, 1969 and 1993, all against teams with large amounts of white), but only the middle one of those games was won. 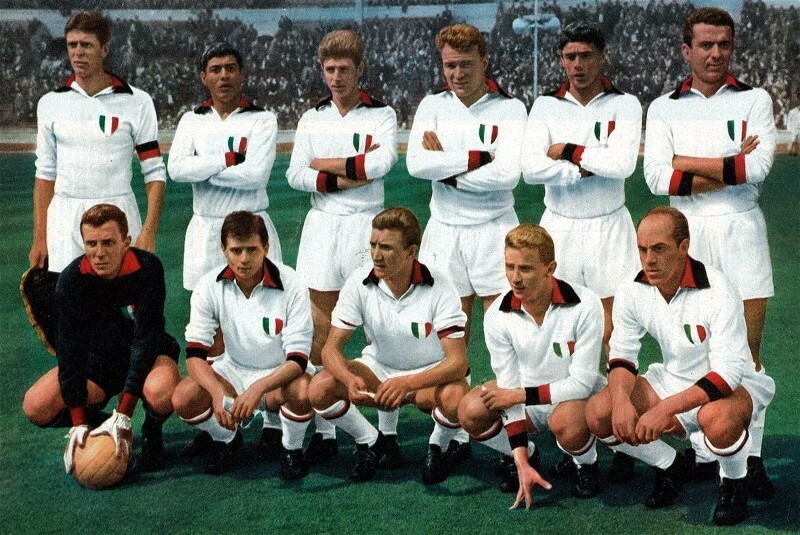 What may not be as commonly known, though, is that for four of those finals, Milan actually wore specially-made white kits, different to their ‘normal’ away strip in each relevant season. At the beginning of the 1986-87 season, Milan commenced a kit-supply deal with Kappa. Taking over from the company owned by club legend Gianni Rivera, who had provided a change shirt with double pinstripes, they reverted to horizontally-striped trim, similar to that seen earlier in the decade, and that style remained for the 1988-89 season. The only addition was the scudetto to mark the club’s first league title win in nine years. In the European Cup, wins over Vitosha, Red Star Belgrade, Werder Bremen and Real Madrid brought Milan to the final, where Romanian side Steaua Bucharest were to provide the opposition. Steaua wore red shirts with blue trim and for the final it was decreed that both teams would change kit. Steaua had worn all-white in beating Barcelona on penalties to win in 1986 but this time they were in dark blue shirts with sky-blue shorts and socks, while Milan would be in white – but, instead of their away kit, it was a plainer kit, resembling that worn by the victorious 1963 team when they beat Benfica. A 4-0 confirmed the ‘lucky charm’ status. The following season, Milan would make it back to the European Cup final, this time against Benfica, and they made it back-to-back titles as they won 1-0 – nobody has won the competition in consecutive years since then. The only difference to the kits for 1989-90 was that the scudetto was replaced by an patch representing the European Cup, while the sleeve trim on the kit in the final was slightly thicker. For 1990-91, the logo of adidas replaced that of Kappa, but it’s questionable as to how design impact the German giants had as the kits remained practically the same. The trefoil would appear on the Milan kit for three seasons, with the club reaching the final of the newly rebranded Champions League. The club’s last game in adidas kit – for six years, anyway – and Marco van Basten’s last game ever would see them lose 1-0 to Olympique Marseille (aggressive in their adidas-ness) wearing black change socks. Lotto took over the equipment contract, and their first away kit saw the red and black stripes lower down the chest, below the wordmark of sponsors Motta, who had replaced Mediolanum in 1992. Once more, though, they made it back to the Champions League final, where Barcelona’s ‘Dream Team’ were apparently ready to be coronated. Nobody had told Milan, though, as they won 4-0, with a newly-updated version of the 1963 style. Lotto went bolder with the away kit in 1994, with liberal doses of red along the shoulders and upper arms, while Opel were now the sponsors. Milan wore that kit in their second-last Champions League group game, a 2-0 ‘home’ defeat to Ajax (the game actually took place in Trieste as crowd trouble in the game at against Casino Salzburg at the San Siro meant they were docked two points and denied home advantage for the remainder of the group stage). Ultimately, it took a 1-0 away win to Salzburg in the final game, again in the away strip, to advance to the knockout stages. Instead of waiting for the final, this time the plain white kit was called into action for all of the games after Christmas – the quarter-final against Benfica and semi-final against Paris St-Germain. The final pitted them against Ajax again, with the Dutch side wearing their navy and dark-red change kit. Incidentally, this was the first time that teams had been allowed sponsors’ logos in the final, though size limits meant that the Opel logo wasn’t permitted. Ultimately, it was fifth time unlucky for Milan, as a teenage Patrick Kluivert came off the bench to get the winner for Ajax five minutes from the end. It would be eight years before they reached another final, against Juventus in 2003, and this time the regular adidas away kit was worn in a penalty shootout win. That was also the case against Liverpool in 2005 and 2007, though in each case the strips were devoid of horizontal stripes in the first case. Recent Milan away kits have had something similar to the 80s and 90s look, but unfortunately they haven’t troubled the latter stages of the Champions League enough for us to discover if they’d have switched to an all-white kit for the final. Maybe in the not too distant future this nice tradition might be revived, but we won’t hold our breath.